You know how they say that some things that come into your life are exactly what you need and they always arrive at the exact time you need them? Well, my experience with Something Strange and Deadly was similar. I’ve been in a bit of a reading slump the past few days, reading books that I haven’t clicked with and writing steadily more and more snarky reviews for them, so when Something Strange and Deadly arrived on my doorstep, I was both overjoyed, excited, and just a tad bit skeptical. In all honesty though, I needn’t have worried. 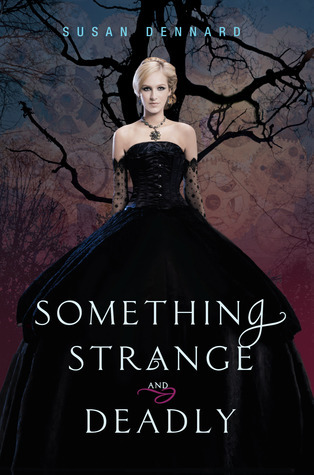 While I will admit that I am a tiny bit biased towards this novel due to its steampunk/historical fiction genre, parasol-wielding heroine, and handsome inventor-turned-romantic-interest, I think Something Strange and Deadly is a remarkably written debut novel that contains something to love for everyone, despite its flaws. In a re-imagined Post Civil War setting, the dead are slowly rising and their armies are populating major Union Cities. When Eleanor Fitt, the daughter of a once wealthy and now deceased businessman, goes to pick up her elder brother Elijah from the train station, she is shocked to find that he has been kidnapped by the dangerous necromancer who is raising the dead and whose army has moved from New York to her own town, Philadelphia. Thus, Eleanor does the only thing she possibly can – she seeks the help of Spirit-Hunters, a small group of people who claim to be able to destroy the supernatural forces at work. While Eleanor begins to spend more and more time with the Spirit-Hunters, including the infuriating, yet handsome, rascal-turned-inventor Daniel, she also begins to uncover the truth about her own past, her father’s death, and most importantly, herself. I don’t think I can even begin to describe how much I enjoyed this novel. Susan Dennard wastes no time in immersing the reader into her world and while the writing was a little sloppy in the first chapter, the action most certainly wasn’t. From there on, the pace is impeccable – fast-moving, intriguing and leaves you constantly turning the pages. Furthermore, I loved how the mystery of Elijah’s disappearance and the mystery of Eleanor’s suitor, the enigmatic Clarence Wilcox who also happened to be an old family friend, came together in an extremely clever manner. In addition, the obvious research Dennard put into her story, placing her characters in real-life settings, and her take on zombie/necromancer lore was both refreshingly original and entertaining. Nevertheless, despite these wonderful quirks, I did have a slight difficulty adjusting to the setting of this novel. It takes awhile for the reader to realize just what time period the story takes place and I still have questions such as why Eleanor’s mother deemed it fit to conduct a séance and release a dangerous spirit, which happened to follow Eleanor throughout the novel. It isn’t the spirit itself that confuses me, but why séances were considered such a popular event in society during that time. In addition to the not-so-detailed world-building, I found aspects of the plot to be rather predictable, but thankfully they weren’t overly stressed like they were in Cinder and never cast Eleanor under the light of stupidity and nor did they particularly bother me, the reader. While these flaws do remain to scar the otherwise perfect qualities of Something Strange and Deadly, they never detracted from the overall experience of the novel. Plus, what really made this story tick were the characters themselves. Eleanor is one of my favorite steampunk heroines – I love the way she brands her parasol menacingly, I love her sharp wit and ready intelligence, and I love the clever manner in which she manages to elude high society to help the Spirit-Hunters and her brother. Not only is she courageous, brave, and filled with admirable morals, she is also flawed, sarcastic, and vastly different from other women of her time. I simply adored reading her narration and to me, Eleanor felt like a long-lost friend. Yet, Eleanor wasn’t the only amazing character in this tale. I loved Joseph, the leader of the Spirit-Hunters who was both wise and powerful. Not only was he kind to Eleanor, but he appreciated her efforts and seemed to constantly encourage her search for her brother and restore her faith in humanity. Jie, a young Chinese girl who managed to stay under the radar by dressing like a man, also became an immediate favorite. She makes Eleanor think about the choices she has and shows her that it is possible to live a life away from the expectations of society. While I loved the diversity that both Jie and Joseph, a black man, brought to this tale, my favorite secondary character was, without a doubt, Daniel. Daniel is many things – an inventor, a fighter, a Spirit-Hunter and, a dashingly handsome and infuriating young man. I loved the witty banter between him and Eleanor and their romance was extremely subtle and beautifully written. Perhaps best of all is the fact that their ending is realistic, shockingly bittersweet, and leaves the reader aching for more. What else can I say about Something Strange and Deadly? It is traditionally a novel about zombies, filled with your usual paranormal and steampunk elements, but it also has a large emphasis on feminism, amongst other themes. I loved the subtle manner in which Dennard managed to weave diversity, social politics, and class hierarchies into this tale and that simply made it all the more richer for me. In addition, while characters such as Clarence Wilcox and Mrs. Fitt, Eleanor’s mother, were not my favorites, I did like the role Clarence played during the novel and Mrs. Fitts’ constant lecturing to Eleanor brought forth many cultural tid-bits of the time period which I thought was a nice touch. Most importantly however, while Dennard’s debut certainly does have its faults, I was able to overlook them and have a truly wonderful time reading this tale. It has quickly become one of my favorites, not only due to its gorgeous cover, but also due to its heart-warming characters who feel like my very own friends. Something Strange and Deadly is, without a doubt, one of the more notable, creative, and original debuts of the year and I cannot wait to get my hands on its sequel to see where this lovely new series is headed. It seems that the one complaint that everyone has about this one is the predictable parts, the unmasking was not a surprise. I personally wanted more details on The Dead but like you I loved Eleanor and Joseph, Daniel and Jie. And yes the ending wad great, too. No cliffhanger! Thanks for honest review. I've been seeing this one around everywhere and I def love the cover. Glad to hear that you were able to get into it and love it despite a few prbs with the setting. I mentioned those seances in my review as well, that part bothered me a bit. But I later read somewhere else entirely that seances WERE a favorite pastime back than for the rich and bored and it made sense. Anyway, I'm so happy this came at the right time for you. I got stuck on minor flaws and ended up giving it 3 start, but I still enjoyed it a lot. It was different for sure. Plus, there is that rascal Daniel that made me smile a million times. Wonderful review!!!! I am REALLY looking forward to reading this one and after your fabulous review I want to read it so much more. The characters sounds very engaging and although I am not a huge fan of zombies this story sounds very entertaining! Thanks for sharing. I love a good historical fiction/ paranormal/mystery novel!!! !